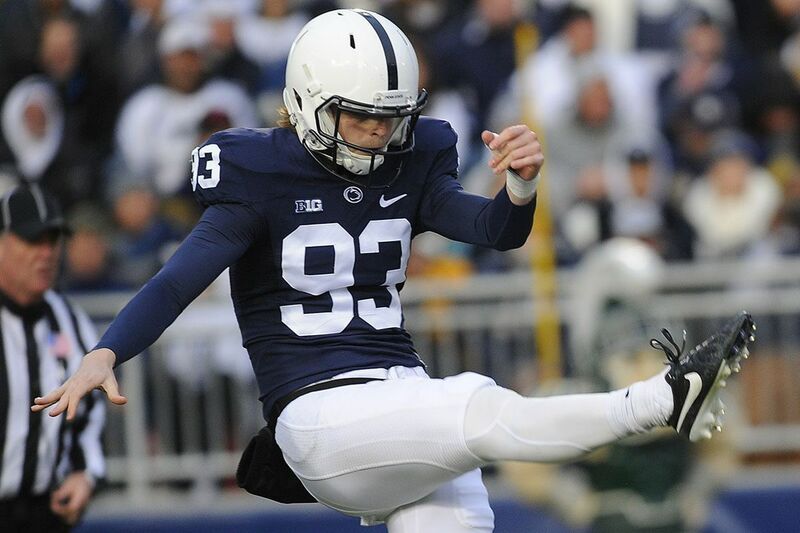 Blake Gillikin has been a consistent punter for the Nittany Lions. Here are position-by-position breakdowns of the Penn State depth chart leading up to the start of the 2018 season. 6-2, 193, Jr., Smyrna, Ga.
Gillikin has been a model of consistency and excellence in his two seasons as the Nittany Lions punter. He has the program's second-best career average, 43.0 yards, and has placed 25 punts inside the 10-yard line. Gillikin punted for a 43.2-yard average last season, good for 35th in FBS, and sparked Penn State to a 39.93 net average (25th) thanks to a coverage team that ranked 20th. He also can kick off, although head coach James Franklin would rather see him focus on punting. Gillikin excels in the classroom, carrying a perfect 4.0 grade-point average as a kinesiology major through his first two years. Pinegar is the only scholarship player in what has become a five-way competition to be the Lions' kicker and their kickoff specialist, two jobs that presumably will go to different players. Pinegar kicked a pair of 60-yard field goals and went 9 for 13 overall as a senior last season at Ankney (Iowa) Centennial High School. He played in the defensive backfield during his sophomore and junior seasons but stuck to kicking last year. 6-2, 195, R-Fr., Macungie, Pa.
Landis is the only kicker in camp who was on the Penn State roster last season. He kicked in last April's Blue-White Game, knocking a 34-yard field goal through the uprights. Tobin attended Neshaminy High School. 6-2, 201, Fr., Chevy Chase, Md. Like Tobin, Checa walked on to the team just before training camp. 5-10, 216, Fr., Holidaysburg, Pa.
Like Tobin and Checa, he walked on to the team just before training camp. 5-11, 188, Gr., Hubert, N.C.
Thompkins, a starting wide receiver who had the highest per-catch average (15.8 yards) on the team last season, ranked fifth in FBS in punt returns last year with a 13.3-yard average. DeAndre Thompkins averaged 13.3 yards in punt returns last season. 5-9, 176, R-Fr., Pontiac, Mich.
Hamler, also a wide receiver, is a former high school track star who reportedly has returned both punts and kickoffs in training camp. 5-11, 210, R-Fr., Meadville, Pa.
Brown, expected to be in the rotation at running back, is a two-time PIAA state 100-meter champion who might become the No. 1 kickoff returner. Special teams coordinator Phil Galiano smiled at media day when asked about Brown's ability as a return man. "His speed, No. 1 — he hits a crease, he's gone," Galiano said. "There's no one that's going to catch him, so that excites me." 5-9, 180, R-Jr., Ashburn, Va.
Polk, a wide receiver, returned 10 kickoffs as a freshman and averaged 20.9 yards.